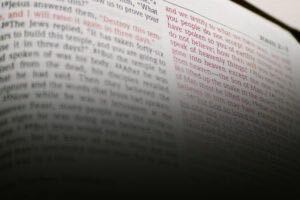 “I understand this objection; there are many places in the Gospels where scribes over the centuries made small changes, either intentionally or unintentionally, resulting in a different word or passage. These resulting variations can seem problematic, for sure. Some skeptics claim we can’t trust any of the New Testament because of the presence of these differences. But let me offer some insight from how crime scenes are worked. I’ve never encountered to a crime scene that wasn’t messy. I wish every crime scene was an orderly collection of helpful evidence, but that’s seldom the case. Instead, crime scenes are filled with relevant evidence and unrelated artifacts. Some of these artifacts are simply items that were in the scene before the crime even started, and some are unrelated items deposited after the fact. Paramedics, for example, often rush to the scene to save the victim and make quite a mess. As a result, I often have blood smears, bandage packaging, medical supplies and more in my crime scene, all of which was caused by paramedics after the fact. . None of these have evidential value in determining what happened or in identifying the suspect; they’re unrelated artifacts. Now imagine I’m the detective working a case in which someone you cared about was murdered. How would you feel if I walked in and I said, ‘You know, I’d like to help you, but there’s a bunch of artifacts in this scene. I’m sorry. I can’t do anything for you.’ I think you’d say, ‘Well, wait a minute, here. You’re being irresponsible and shirking your duty. You’re a detective! You’re supposed to separate the artifacts from the evidence so you can make your case.’ I think you’d be correct in making those statements. Detectives do have a duty and we fulfill it all the time, even in difficult crime scenes. We employ a technique, a process, to separate the artifacts from the evidence. By using this process, we’re able to determine what has evidential value and what doesn’t. We’re able to return the crime scene to the condition it was in prior to the entry of late artifacts, and we’re able to separate unrelated elements from important evidence. It turns out the textual critics do the same thing with the Gospels. They have a process in place that helps them identify variations and late entries. Better yet, they are able to compare the manuscripts to determine the most reasonable original ‘reading’ for each verse. Even the skeptic who says, ‘I see a variation,’ is employing this process, but incompletely. The same process that successfully identifies a variant can also be used to remove the artifact and reliably restore the document to its original condition, even if the ‘crime scene’ is messy.